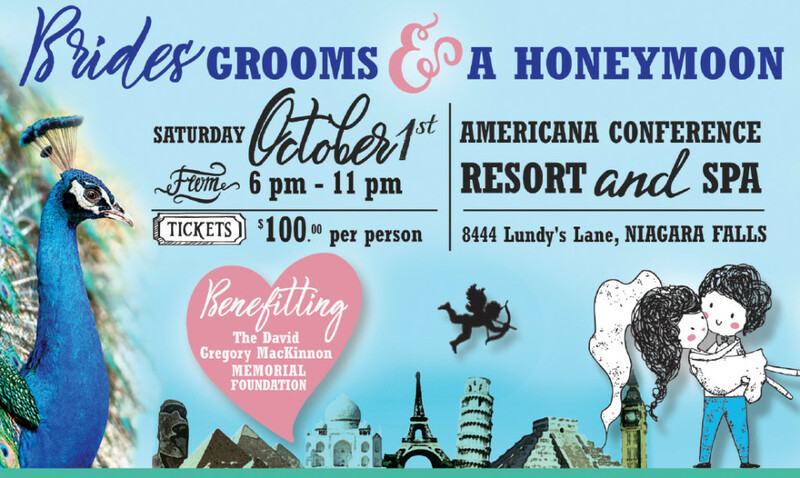 Join us this October 1st for the David Gregory MacKinnon Memorial Foundation’s premiere special event: Brides, Grooms, and a Honeymoon! What: We invite you to wear your favourite outfit of weddings’ past for this fun-filled evening of extravagant food stations, games, music, and laughter – all proceeds going towards the David Gregory MacKinnon Memorial Foundation. Have that old bridesmaid dress in your closest that hasn’t been worn since the mid-90s? Tonight is the night to break it out! Why: To raise $50,000 for the purchase of two renal ultrasound units. These units will substantially improve treatment, testing, comfort and quality of care in our Renal Program. Includes dinner, (6) passes to enjoy the games, and welcome cocktail. A cash bar will be available. A block of rooms has been reserved at the Americana for our guests at a discounted price of $149.00+ and resort fee per night. Please call (905) 356-8444 to make your reservation. About the Games: A unique twist to this fun evening, we will have a variety of games for you to partake in – from basketball toss to jousting to Giant Jenga – there is something for everyone! Additional tickets for these games can be purchased for $10 for a (6) game pass. Honeymoon draw tickets can be purchased one for $25, or 3 for $50. Travel by April 30, 2018.